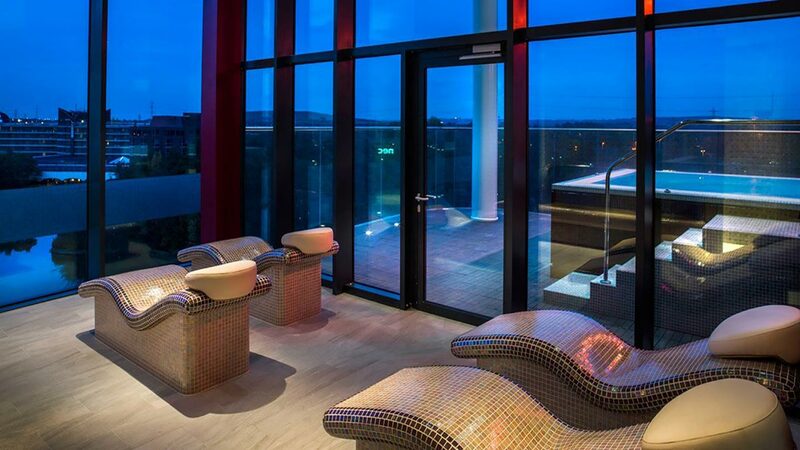 On the outskirts of Birmingham, you’ll find Santai Spa within the large, modern and chic Genting Hotel. Think atmospheric lighting, dark shimmering colours and floor-to-ceiling windows showcasing cityscape views. Float around the 15-metre pool, relax on a heated pool lounger, try the salt cave and sauna, then get some fresh air in the outdoor hot tub overlooking Pendigo lake. Treatments are luxurious and pampering or targeted and medi-spa. Facilities are for over 18s only. Malaysian-themed Santai Spa is part of the Resorts World entertainment complex near Birmingham's National Exhibition Centre. One minute you're in a shopping mall in the West Midlands, the next you feel you're checking into the hush and comfort of a five-star Kuala Lumpur hotel. Santai Spa is small but perfectly appointed, with a theme of dark wood, deep greys and reds, pearlescent mosaic tiles and Islamic-inspired geometric patterns throughout. 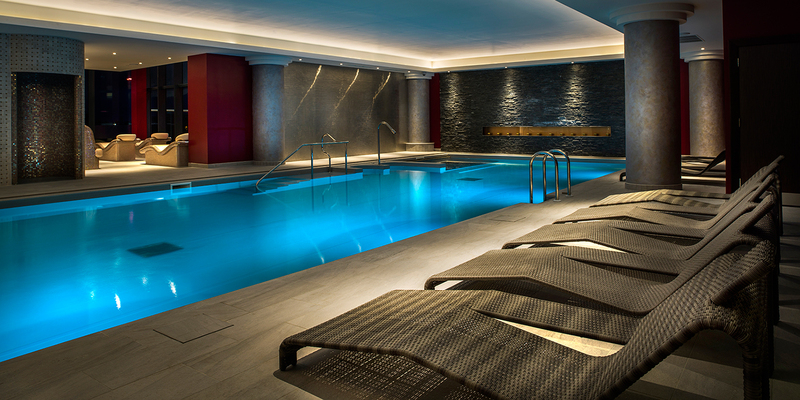 The pool area feels quiet and floor-to-ceiling glass drench the spa in natural, welcome light. Santai Spa's reception area is bright with orchids and the mirrored Vive bar, specialising in juice and well stocked with fizz. A friendly receptionist greeted us and took us to the comfortable chairs and sofas while we filled in our consultation form. Santai Spa's changing rooms are compact but were faultlessly clean during our visit. The amply sized lockers are operated with fobs -- simple and easy to use. The showers were well-stocked with shampoo, conditioner and body wash, and there are two small vanity stations with mirrors. We loved the little lavender bag in our locker and the plentiful supply of fresh towels. The wet and thermal facilities centre on a 15-metre pool, complete with hydrotherapy bubbles and jets. There's also a salt cave, sauna, rain-shower and an outdoor hot tub. The salt cave, a steam room infused with a fine mist of salt designed to benefit the skin and respiratory system, has horseshoe-shaped seating that would comfortably seat eight people. The rain-shower is fun to use with its various choreographies of fragrance, temperatures, light, and intensities of "rainfall". Our favourite was the outdoor hot tub. We braved the winter drizzle but, once in the warm water, could have bathed for hours. 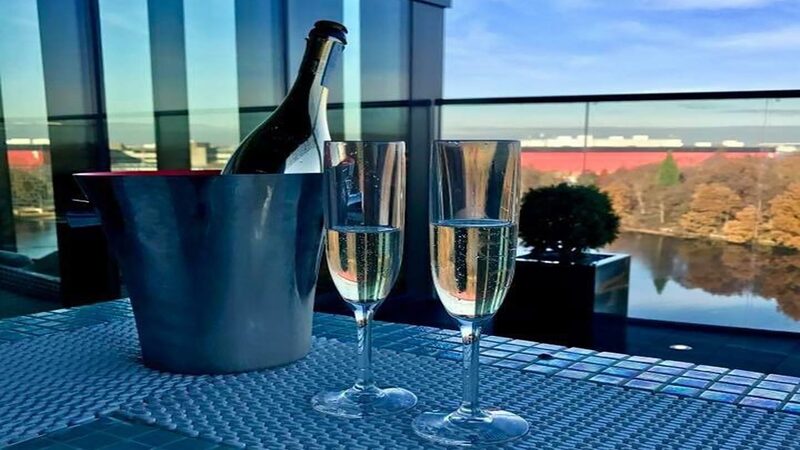 The distant views over Pendigo Lake to the NEC and M42, rather than detracting from the luxury, helped us feel tucked away from everyday life. 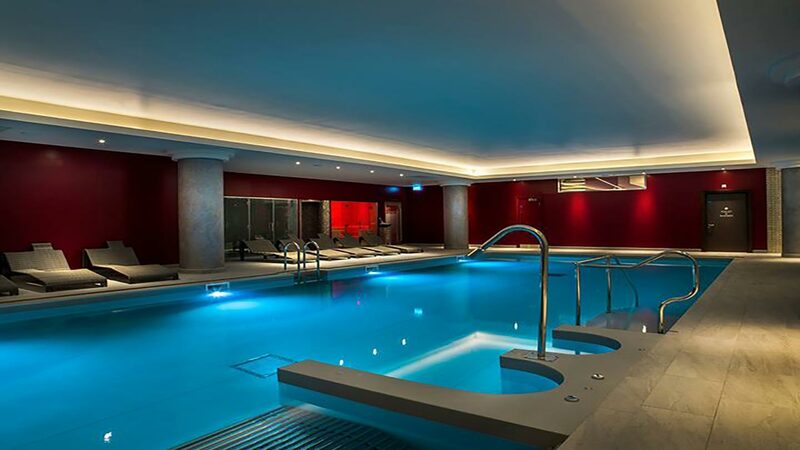 The relaxation area, between the pool and changing rooms, has four heated mosaic-tiled loungers, shaped to cradle the natural curve of the body. There's a well-equipped gym, too. We tried the Lava Shell full body massage (75 minutes, £115). My therapist, Ania, found me in the spa and took me through to our treatment room. It was very simple with just a picture of a Buddha giving a nod to Santai Spa's south-east Asian influence. Ania explained how a Lava Shell massage works: special gel sachets inside tiger-striped clam shells create a heat that can last for well over an hour. The warmth from the shells when used as a massage tool is excellent for easing tense muscles, boosting circulation, and aiding relaxation. Ania applied massage oil -- one I'd selected from a choice of three -- to help the super-smooth Lava Shells glide easily over my body. She used them almost as an extension of her hands to work through my knots and leave me feeling hopeful for the future of my back. The delightful warmth from the Lava Shells combined with Ania's firm but carefully personalised massage must have sent me to sleep because, before I knew it, she was working her way down my arms to my fingertips and I was coming round from a soothing holiday dream. 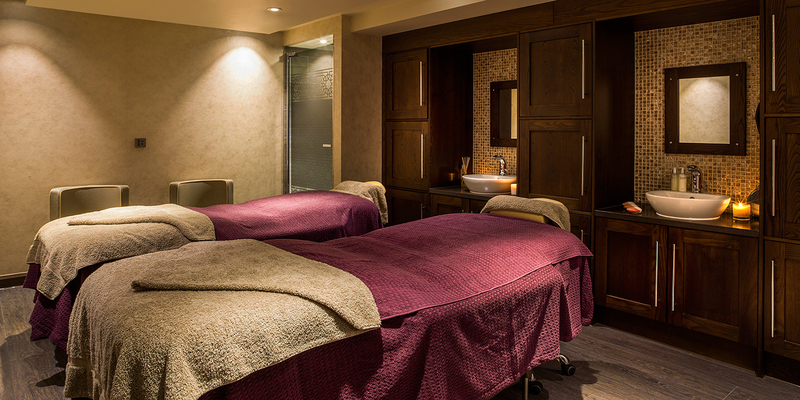 I felt supple, lighter and lulled after my massage; I would cheerfully have drifted off for a few hours. My limbs ached the next day, as Ania had warned me they might, but even this felt like a "good" ache, as though I'd been working out. Heaven Skincare by Deborah Mitchell is famous for using bee venom in their products, and you can try the Abee Toxin Massage or Facial at Santai Spa. As well as massages, facials and beauty treatments, Santai Spa offers a range of medi-treatments such as light and laser therapy and injectables. If you are visiting for the day, you can eat in the reception area in your robe; as the other guests were similarly dressed, we felt quite comfortable. We tried Malaysian high tea: first dim sum (the vegetarian option included yummy dumplings, a veggie skewer with umami-rich dipping sauce and a yuk sung-style lettuce leaf with mango salsa), followed by hand-made sweet treats. The latter were exquisite but enough for two people! We also had "Flora Tea", made from a compressed ball of green tea leaves and aromatic flowers which opened dramatically when steeped in hot water. If you prefer more savoury than sweet, you could also try light lunches such as chicken Caesar salad and a superfood salad. Not having to clock-watch: I was told my therapist would find me in time for my treatment (and she did). I was also "invited" for lunch once everything was ready for me. The excellent customer service: For my entire visit, the staff were friendly without being over-familiar, attentive without making me feel fussed. We would have preferred opaque glass in the shower cubicles! Smoked glass left us feeling a little exposed. Santai Spa is best suited to quiet catch-ups rather than big parties, making it the ideal day spa for mothers and daughters, couples, best friends, and solo travellers. Serene Spy visited in February 2017 and awarded it 4 Bubbles. "When I went in the summer there were no facilities to eat in reception area as I had previously. We had to get dressed and eat in public restaurants (or their hotel). I wrote a complaint but this wasn’t even acknowledged. 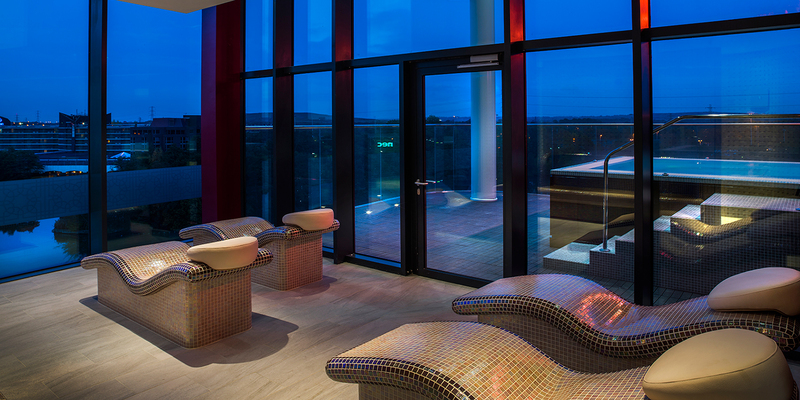 This spa should not be a contender for the good spa guide. " "Excellent day spa for a few hours or 1/2 day, very attentive staff and a wonderful outdoor hot tub . I really love the gold mosaic designs . " 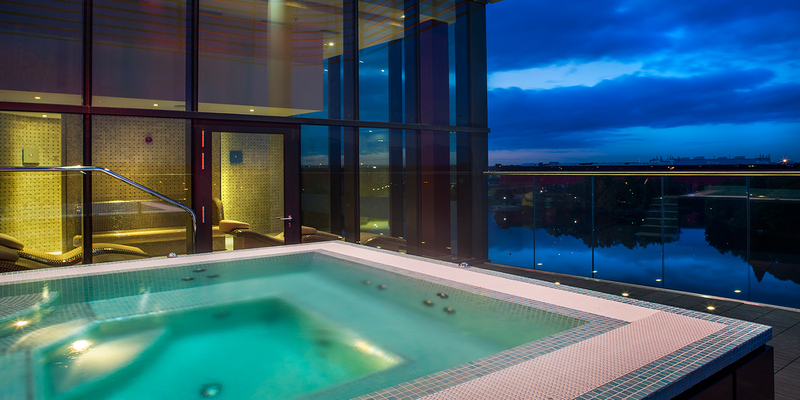 "Santai spa is the most luxurious spa in Birmingham, the facilities are lovely and the outdoor hot tub is a real treat. The staff are so professional and trained to the highest standard, they can not do enough for their clients. It's the little touches that go a long way and this spa is excellent. I can't wait to visit again. " "beautiful spa, lovely staff and fantastic treatments "
"Santai spa is a beautiful tranquil environment perfect for any occasion! 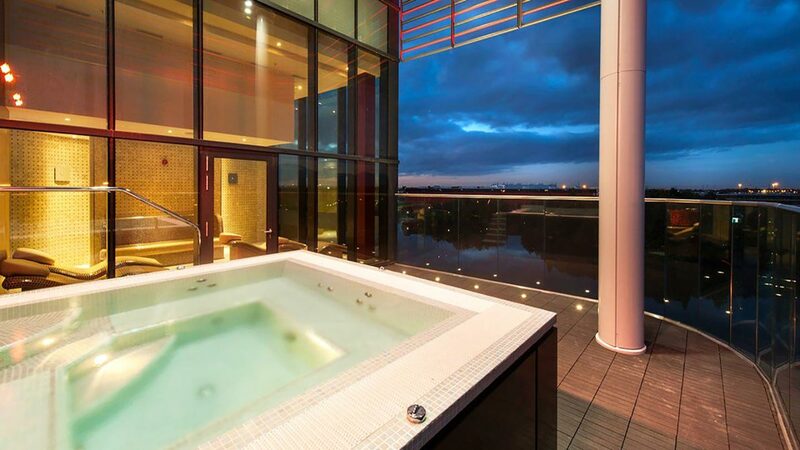 Amazing service & 5 star treatments on offer, the facilities sell them selves with my favourite being the hot tub on the balcony literally felt like i was on my holiday. Would certainly recommend this spa & will be returning. " From classic British dining with renowned chef, Andy Waters, to sushi at The Sky Bar and well-known favourites like TGI Friday’s, Las Iguanas and Pizza Express, whether it’s for a romantic meal for two, a business dinner or a meal the whole family can enjoy, there is something for every occasion at Resorts World. Resorts World is home to the Genting Hotel, which boasts 117 luxuriously modern signature and superior rooms along with a range of themed suites. Car parking at the NEC campus can sometimes be limited due to events and exhibitions and they advise to pre-book your car parking space in the underground car park. Spaces are charged at £15 per car per overnight stay. Please contact the hotel directly to book your space on 0121 273 1000.